The experts say selection and show preparation are a science that will aid in predicting the final product of your sheep. A well-planned feed and exercise program is the foundation for any winning project. In order to establish a feed and exercise program, you have to understand the genetics of your lamb, and how to tailor your program. The type of lamb selected will have a major influence on the results. Select a lamb with structural correctness, muscle, eye appeal, and growth potential. 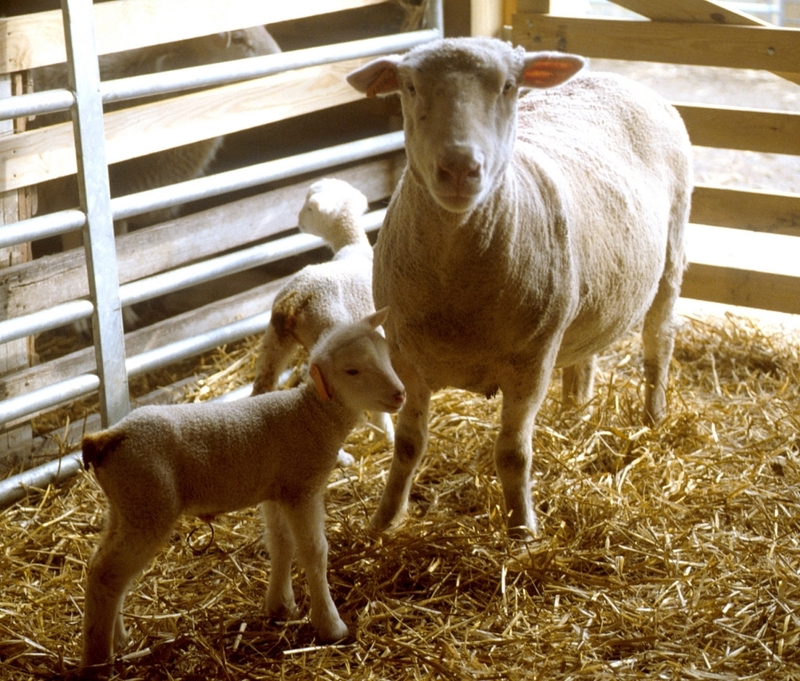 The best age to select the project lamb is two to three months of age. If the lamb has muscle shape or structural flaws at that age they will have the same problems later in the show season. Evaluate lambs on the farm in their natural environment and look at the lamb several times before purchasing to evaluate growth potential. Also, check to see if the lamb has been vaccinated for enterotoxemia (overeating disease). After purchasing the lamb, it is time to develop a feeding program. A goal would be to have the lamb weigh 100 pounds 60 days before the first show. This weight is a good place to start managing weight and finish for the show. Take the show schedule into account and feed accordingly. Your feeding program is the simplest way to manage the lamb’s weight gain. Remember each lamb is an individual and they do not all grow the same or have the same body composition. With this in mind it is important to feed each lamb individually when they reach 100 pounds. There are many feed choices, but select a base ration in the 14-18 % protein ration in pellet form. The higher the protein content, the easier it is for the sheep to put on fat. The 16% ration works well in terms of growth and muscle building. As the lamb gains weight the protein should be decreased because they need less as the reach their endpoint. The 60 days before the show the lamb should be fed a protein ration to develop muscle shape and expression and the proper amount of fat. One month before the first show the natural endpoint should be taken into account. Pounds of feed help determine where the lamb should be. Example if you are feeding 6 pounds a day of an 18 % protein feed, the lamb should gain 1 pound per day and if you cut that back to 3 pounds a day the lamb will gain closer to a half pound per day, so in 30 days the lamb will gain close to 15 pounds. For inexperienced showman there is no simple conversion in adjusting back fat, it depends on the size of the lamb, the projected stress level (based on environment and movement), the lamb response to feeds, and exercise. This is the one area where experience will improve the final results. Water intake is important and should always remain the same in a feeding program. Before stress period adding electrolytes will help animal hydration issues. Feeding a nutritionally sound, balanced diet and keeping the lamb blanketed will promote good skin and fleece condition. Exercising lambs is a necessity. Just like feeding, a schedule is also critical for exercise. When the lamb reaches 100 pounds the exercise should begin. Exercise should start 60-90 days before the show. Walker are used during most exercise periods to promote head placement and proper speed of movement while improving endurance. Walking for one minute, and then let the sheep stand for one minute. Eventually, work up to walking for an hour. At big shows, classes can take up to an hour to judge. So preparing your sheep to stand and walk for that long is important in showmanship. There are several regimes to exercise lambs. One example is to exercise every other day throughout the show season. Consistency is the key for a successful feed and exercise program. Drastic changes in the management program will do more harm than good. Remember every lamb is different and understanding how to tailor your exercise and feeding program to each lamb takes time and experience. Maintain a relationship with the breeder you purchased you lamb from and inform them of the lamb’s progress they can give you feeding tips. By putting in the needed work in the time leading up to the show, you can have a successful lamb project. It’s all a matter of understanding the SCIENCE. Posted by Braden Campbell at 8:00am January 4, 2019 Posted in Resources and tagged Management, mark, Resources. Bookmark the permalink.